In this day and age of high energy prices, it is important to take steps to reduce the amount of energy that we use within our homes. According to energy experts, our HVAC systems are are responsible for the majority of the energy that we use within our properties. As such, any improvement that you can make to your HVAC system can result in substantial savings. The easiest way to know whether your heating and air conditioning ductwork is performing optimally is through professional air duct testing in New Jersey. At Steele Mechanical, LLC Air Conditioning and Heating, our New Jersey HVAC contractors specialize in a wide range of energy efficiency improvement services. One such service is testing air ducts for leaks. If you have a central air home comfort system, you should check to see if your air ducts are in a proper state of repair. Call Steele Mechanical, LLC Air Conditioning and Heating today if you are interested in testing your air ducts for leaks. Our New Jersey heating and air conditioning contractors would be happy to assist you in any way that we can. Our knowledgeable experts can answer any of your questions. We can schedule your appointment today. One of the many reasons it is important to have a well sealed air duct system is that any leaks can cause a substantial amount of energy loss. According to energy experts, air duct leakage can cause heating and cooling bills to rise by up to 30%. When you hire our air conditioning company to conduct duct testing services on your HVAC ductwork in New Jersey, you place yourself on the path to eliminating these inefficiencies. With our help, you can help reduce the amount of energy needed to keep your property comfortable. You are guaranteed to be satisfied with the resulting energy savings. Another reason it is beneficial to identify air leaks within your ducts is that it will allow you to improve the comfort that you enjoy within all the rooms of your home. If your ducts are leaky, the rooms that are farther away from your central air system will be harder to keep cool in the summer and warm in the winter. Through our duct testing services, our heating and air conditioning professionals can help you vastly improve your entire HVAC system. 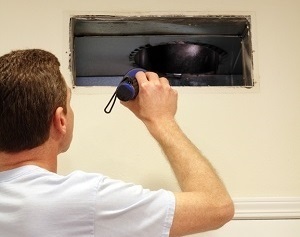 After we identify how much air is leaking out of your ducts, we will be able to conduct the precise repairs and sealing services that will resolve all problems. Your HVAC system will be more efficient and will provide you with an enhanced level of comfort. If you would like to schedule air duct testing in New Jersey, please call 609-259-3210 or complete our online request form.